You know we just cannot get enough of bullet journal ideas and inspiration around here. In fact we have so many posts that we thought it was time to gather them all up into one place so that you can easily find what you need. Make sure you save this post to your Pinterest account so you can come back to it later, because we are not finished in our quest to find the most creative BUJO layouts and we will be updating this page regularly! 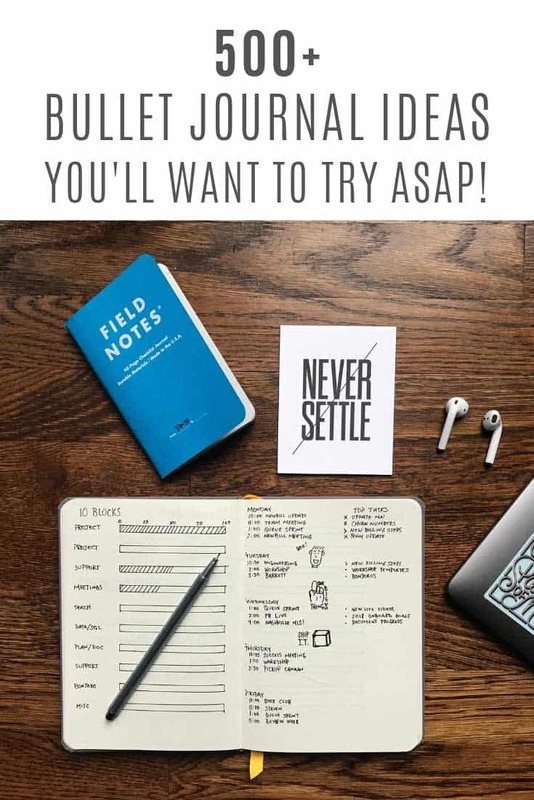 A bullet journal is a type of journal that includes multiple sections in order to keep track of the multiple areas of your life all in one place. Bullet journalling takes the organizational elements of a planner and the creative elements of a journal and puts them together into a system that is easy to use, doesn’t take too much time, and will help you to keep your life in order! If you want to know more about the system and whether it would work for you take a look at our How to Bullet Journal Guide which will walk you through all of the benefits and then show you how to set up your first journal. If you’ve already decided to give it a go but have no idea where to start then try our Quick Start Bullet Journal Setup Guide which shows you how to get started in just six simple steps! There are so many things to track in your bullet journal that once you’ve set up one collection they can become a little addictive! 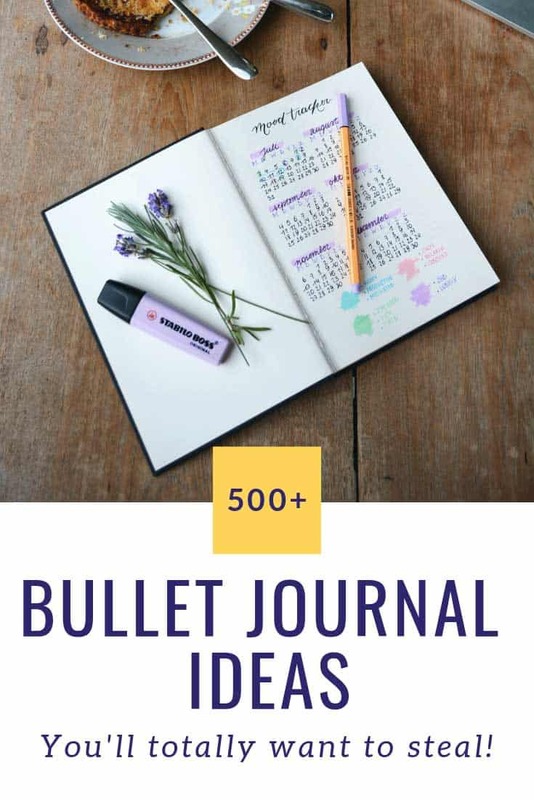 For an overview of the things you can track check out our super popular post: Bullet Journal Tracker Ideas which has about 85 different ideas to get you started. If you have been noticing that you find yourself easily triggered, falling into certain negative moods, or that you can’t seem to change your mood when you need to then you could benefit from adding a mood tracker to your bullet journal. Mood journals can help you determine not only what put you in a certain mood, but also what to focus on to remove negativity from your life and reduce bad moods. One of the benefits of using a bullet journal is that you can pick out a different theme or color scheme each month. As part of this creative side many people like to include a decorative cover page, or title page to welcome in the new month. This section is where we’ll add links to our cover page inspiration as we move through the year. The weekly spread is the planner element in your journal and it’s a really useful way to be able to see the whole week’s events and tasks at a glance. The options for a weekly layout are infinite, you can choose how to lay out the days, whether to include a meal planning section or an area for notes or a habit tracker. You can also choose whether to be very minimalistic in the design or whether to add doodles or illustrations. Of course the best thing about it being a weekly spread is that you can test and tweak adding in new elements each week and taking bits away until you come across the perfect weekly page layout for your needs. Last year we rounded up as many weekly spread ideas as we could and since then readers have been asking for more. Be sure to check back regularly as we add more themed spreads to inspire you. I think the reason bullet journalling is so popular is that the system at the heart of it is super simple, but there are infinite ways to make it your own. You can be as creative as you want to be and you can design and redesign your page layouts to your heart’s content. The best bit is that you don’t need to BUJO in isolation. Across Facebook, Pinterest and Instagram (as well as in offices and coffee shops) people are sharing their page layouts and their creative doodles and illustrations. There is so much inspiration out there that it is very easy to fall down a rabbit hole and spend hours drooling over other people’s spreads! In this section you’ll find links to collections of ideas I’ve pulled together in a quest to “categorise” the awesomeness. Whether you’re looking for themes, doodles, headers or banners you’re certain to find some inspiration here! You can bullet journal with just a pen and a notebook, but there are so many fun things you can use to be creative in your journal and motivate you to keep using it! Previous PostPrevious 500+ Easy Family Meal Ideas That Are Kid Friendly and Taste Great!